Google started as the first ever web and everything came in after that. Google was there even before Friendster and MySpace; it was present even before the bubble burst and also before Facebook and Twitter. These were all the digital giants that had started working in the very early periods of internet. If we look at the last twenty years in the past, we can clearly see the fascinating history of these web giants. Some of these giants got hampered with the tech’s arising challenges so they collapsed on their way. Some of these early web giants are still pulling their way through all the troubles and some have either sold the companies or have merged with other tech giants. 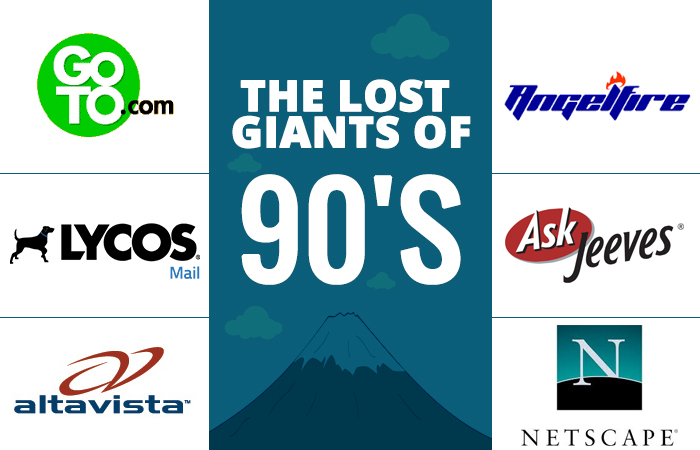 Let’s take a look at some of the famous brands who were once a giant of 90’s but not anymore. With the introduction of internet in the mid-1990s, there arouse a need for search engines to explore the web world. Among all the search engines that were launched at that time, Alta Vista became prominent for having largest indexes along with an advanced set of tools for that time. But in the highly competitive industry, it soon lost its significance and got sold many times before completely shutting down in 2013. Angelfire was launched for people who wanted to share their thoughts with the world. It was a popular place for teenagers to post their views. It came long before Tumbler and MySpace but lost its importance in the tech industry and failed to compete with other giants. This company served all the purposes for providing an early introduction to the web users. It was really helpful for the users to have a good understanding of the internet with its simple and easy methods. It provided easy ways for surfing the web to the users. Its pricing structure for web in 1996 was $20 per month and promoted the always online future instead of pay-by-the-minute usage era. Almost half of the Americans at that time were using AOL for getting an internet access. Ask Jeeves served as a natural language search engine and provided answers to questions along with a useful set of links. The users benefited from it for knowing the meaning of most the new terms that were introduced at that time. Compuserve provided easy graphics and flat fees. The company went strong with its marketing strategies. It served as the initial provider of the home retail ISPs for users but AOL dominated the ISP game by the mid-to-late 1990. Ended: It is still operating technically after being purchased by Ask Jeeves in 2004 but currently in operation by Mindspark. Ended As: A web portal with all the latest features of 2003 the company offers. Excite joined the web in early 1990s and became one of the popular search engine/web indexing site. It soon established its place and became the most visited site at that time. But by the end of the decade, the company merged with another venture which was then regarded as the worst merger of all times. GeoCities was the first of its kind to provided people with a webpage. Everyone used to go to GeoCities for developing their webpage. This company was then acquired by Yahoo in 1999 for $3.5 billion. But with the advancing technology, MySpace also came up with same idea and GeoCities lost its dominance in the web world. Another search engine at that time was Lycos. It is one of the companies which are still operating today. It not only served as a search engine, but also worked as a web portal that provided people with developing homepage facilities in the early 90s. Netscape was the most chosen browser after the dial-up ISP system began to popularize. It was also because there was not much of a choice at that time for accessing internet through dial-up system. But Netscape is always known for its products and services for the web. It has brought many important features for the modern internet which includes Mozilla (Firefox) and Microsoft (Internet Explorer). Prodigy was another dial-up product that was used by many of the customers to access internet at that time. Like CompuServe, Prodigy also lost its influence in the market although it still continuous as an ISP. Tripod targeted the young audience in the early days of the internet. It was similar to what Facebook and Yahoo are doing nowadays. 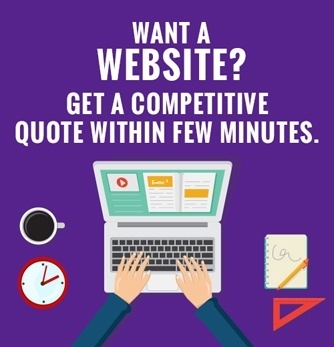 It began as a service provider for the younger generation, for college students and also offered various website building services. But it soon realized that college students were not accustomed to paying anything for getting services so Tripod focused all of its efforts for the web hosting. Goo.com started as a successful service provider of the pay-for-placement search services. It was established with the idea that paid listings would be more relevant as compared to other services. It appeared as a great platform for general searches and worked as a good business model. This was relatively a fresh model at that time. On October 8, 2001 the company named itself as Overture Services, Inc. the success of Overture Services made it possible to gain control of the popular websites such as Alta Vista and AlltheWeb. Yahoo acquired the company on October 7, 2003 for about $1.6 billion.